They never wanted to be cuddly and lovable. After coming so close a year ago, all the Kaimuki Bulldogs wanted was a state championship. With Friday's breathtaking 61-53 win over top-seeded Punahou, the 'Dogs got their wish. The price was steep, from top to bottom, and they made the individual sacrifices necessary. Kelly Grant grew up a block away from the campus only to win a championship as a shooting guard for Maryknoll 23 years ago. All the X's and O's he absorbed from years under coach Tony Sellitto didn't necessarily prepare him for the task of coaching the Bulldogs. They were, and still are, not quite soft and cuddly. They have bite behind that bark, and these 'Dogs tested Grant every step of the way. There are few other coaches with the basketball IQ and street savvy necessary to guide this pack of Bulldogs. After a 7-5 regular season, everything that Grant and his staff taught and reinforced finally began to kick in. The effect, in hindsight, of a master dog whisperer. Beau Albrechtson, Daniel Colon and Keone Reyes were clearly the best 1-2-3 combo in the postseason, complementing each other's strengths. In the title game, Albrechtson stayed out of foul trouble and had 16 points to go with 16 rebounds. Reyes scored 21 points despite early foul trouble. The trio combined to shoot 19-for-21 from the foul line. Alone, however, the trio couldn't win the Oahu Interscholastic Association Red championship, nor a state crown. Point guard Brandon Madamba stepped up in a pivotal way as a senior, teaming with Colon and Reyes to give Kaimuki one of the best press-breaking units in the state. The bench, once a weak spot due to inexperience and youth, also evolved in time. Chauncey Nicola backed up Reyes and Makalii Nahinu with efficiency. The two husky post players gave up 6 inches in height to Punahou's Spencer McLachlin and Saint Louis' Scott Smith. "I was nervous at first," Nicola admitted. "They can outjump me. They're taller. But Keone said to give it all I got with all my heart." Junior varsity call-up Desmond Tautofi had a major impact in the win over Punahou. A 6-2 freshman with the size of a college lineman, Tautofi follows a line of brothers who excelled at Kaimuki. He is the first among them -- David, Darrell, Darren, Daniel and Dexter -- to put his hands on a state championship trophy. "Yeah, I was nervous when coach called my name," he said. Together, the big 'Dogs helped Kaimuki outrebound Punahou by a staggering margin: 40-22. Colon, whose contribution as a steady ballhandler went beyond an 11-point night, was as surprised as anyone with Tautofi's composure. "I was surprised that he finished plays. Freshmen should be nervous," he said. Without Tautofi, it is questionable whether the 'Dogs could've withstood Reyes' foul problems. Grant's willingness to tinker defensively was a huge benefit to the Bulldogs. Using both diamond-and-one and triangle-and-two looks in the postseason, Grant turned to the former against Punahou. With Madamba relentlessly chasing, Punahou's Miah Ostrowski managed to score 14 points on 6-for-16 shooting. "Coach prepared us for Miah. It's the same defense we used against Kalaheo," Albrechtson said. "We listen to him because he was a champion when he played. He's unbelievable." More importantly, the Buffanblu offense never got in sync as Kaimuki's defense collapsed on Ostrowski and McLachlin, the 6-foot-7 senior center. No other Buffanblu player was able to step up consistently despite open looks. "I was surprised. I don't know if they were prepared or not for our defense," Grant said. "The diamond is a great defense. It's not something you practice every day. It just forces the other four (offensive) players to step up or not." Sometime that night, the script that gave Punahou its first state championship since 1999 suddenly went through a revision. By the time Reyes returned to the game in the fourth quarter, Kaimuki had solidified its control of a game that turned them from Underdogs to Wonder Dogs. With strong performances by other OIA Red East teams -- Kalaheo finished third and Moanalua reached the fifth-place game -- it certainly seems now that the gap between Oahu's public-school league and the private-school Interscholastic League of Honolulu has narrowed considerably. 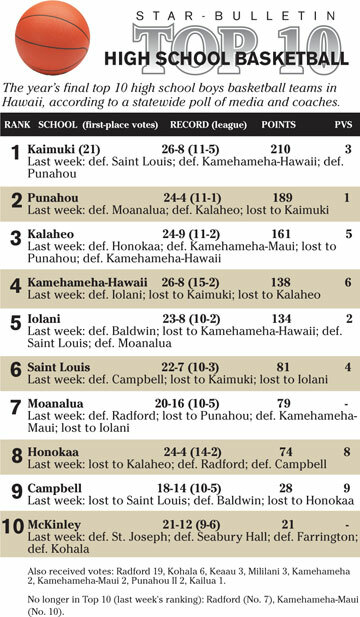 The ILH's other state entries -- five-time defending state champ Iolani and Saint Louis -- didn't reach the semifinals. Former Punahou coach Greg Tacon isn't surprised. "This program has the unique ability to always play its best at the end of the season. No team can match the emotion and passion that they play with," said Tacon, who guided Moanalua to two regular-season wins over Kaimuki this season. "Beau and Keone always came through when needed." They came through not only on the hardwood of the Stan Sheriff Center, but off the court. With encouragement from their assistant coaches, the Bulldogs decided to forget about a slew of officials' calls that nearly broke their backs. "We went through it before on the Big Island," Albrechtson said of a December tournament in Hilo. "We got killed with calls that time, too. We said in the locker room, 'Don't even bother with the refs. If we have to go five on eight, we'll do it.' "
In the second half, calls didn't affect Kaimuki as much, and the Bulldogs took control. "One of our coaches said (at halftime), 'What goes around, comes around,' " Reyes said. "No doubt, Punahou is a great team, but we were prepared." "All this hard work paid off."